Safe, practical and fun, blinds offer lots of benefits for children’s (and teenagers) rooms with bright colours and fun designs with lots of useful features like light control and privacy. Above all else, safety comes first when selecting the right product for your home. Download our Child Safety brochure here or visit your local Luxaflex® showroom to get expert advice on choosing the right products for your home. Lighter mornings can affect your children sleep pattern? Lighter mornings, can disrupt regular sleep patterns with unwanted early wake-up calls. Equally lighter nights can make children or babies restless. We all know they don’t want to go to bed when it’s still so bright outside! 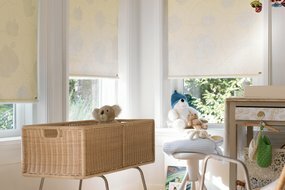 When bedtime also means ‘straight off to sleep please’, Luxaflex® blinds with room darkening fabrics are the perfect choice. Stay warm and cosy or keep cool? 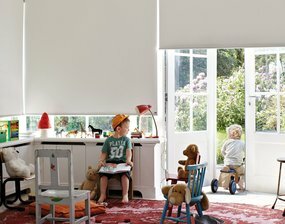 Our Luxaflex® Duette® Shades not only help your children get a more restful sleep so you all wake up feeling naturally refreshed, but the unique honeycomb construction is designed to keep your bedrooms (and home) cosy and warm in winter and comfortably cool in summer…and safe the whole year round. 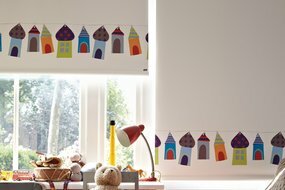 Big, bold, happy colours…vibrant, zingy patterns…Roller Blinds give any youngster the chance to choose something that’s just right for them. And designed with safety in mind. 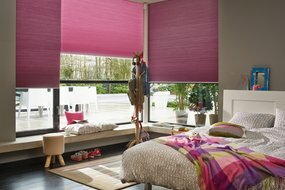 From tots to teenagers, Luxaflex® Designer Roller Blinds are the ideal bedroom option. With hundreds of beautiful colours and designs, our Expressions collections brings out your creative style with romantic florals, exciting and contemporary graphics, stylish borders and lively designs for children. The possibilities are endless. See the whole range at your local Luxaflex® Showroom. Our innovative LiteRise® system lets you simply pull your blind up to raise it…or pull down to lower it. And the level you leave it at is where it stays. Because it is cordless, it is simply safer too. Luxaflex® is custom made for you. Our showrooms can help you finding your own personal window decoration.